China called and it wants its art back. It's no surprise that the Middle Kingdom wants its popular art piece “Three Heads Six Arms” to return back home sometime next year. But that isn't stopping San Francisco from raising funds to pay what it owes for hosting the exhibit in Civic Center. The total cost for the exhibit is about $150,000 and Tuesday, the San Francisco Board of Supervisorsapproved a $70,000 grant from the National Endowment for the Arts to help pay for the piece by Zhang Huan. 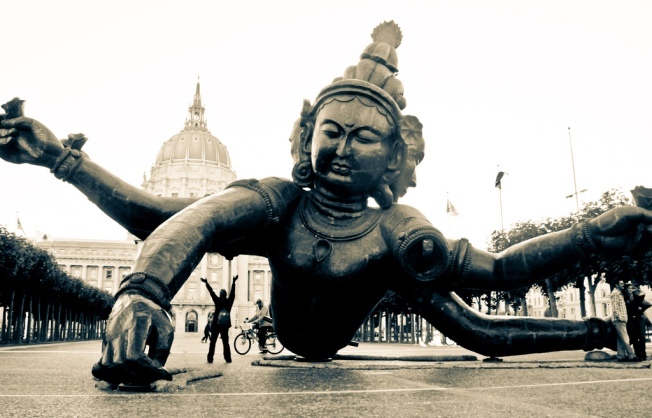 The piece, which aims to restore the dignity of Buddhist statutes destroyed during China's Cultural Revolution, depicts exactly what it sounds like: three heads and six arms in front of San Francisco City Hall. The massive art installation made it into the country with the help of powerful friends, such as Sen. Dianne Feinstein, but the same people have not been able to keep the piece in the country beyond next spring.